What's all this then? 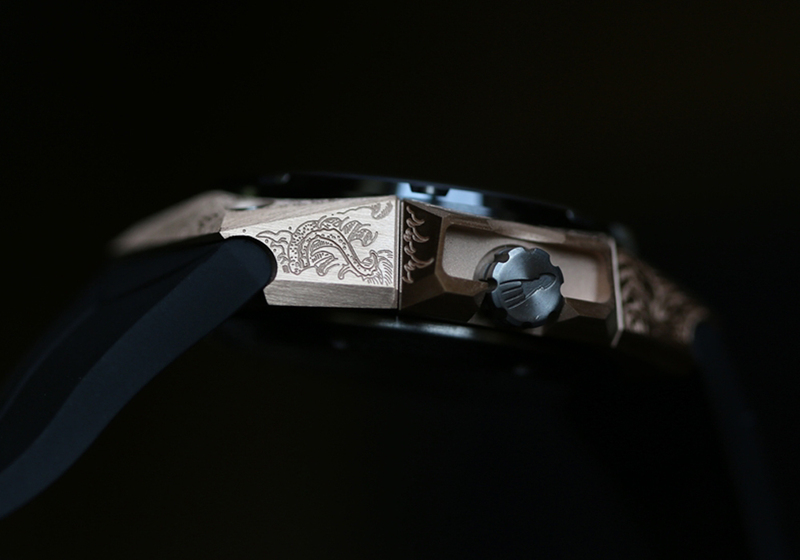 Elaborate embellishment on a Linde Werdelin case? Relax - the result is anything but fussy, this is LW afterall and this is their latest watch, the Linde Werdelin Oktopus II Moon Tattoo. Perhaps you may recall the Oktopus II Tattoo watch which was unveiled at BaselWorld 2010 with its charmingly distinctive tentacle covered hands? It was, alas limited to just 82 pieces worldwide. Now there's another chance to bag a fancy-cased Linde Werdelin watch. Better still - this one is powered by a movement which features the company's first in-house complication entirely conceived, developed and produced by LW, which was first unveiled at the beginning of 2013 and which marked a realisation of ambitions for Linde Werdelin and a new maturity for the Oktopus collection. All Linde Werdelin watches are fine examples of the amalgamation of cutting edge machinery with the fastidious hand-finishing that only the human touch can bring, the Oktopus II takes this to a whole new level with engraving which has been achieved at different depths thus creating a three dimensional effect. The unexpected features of this complex case made from 18k rose gold are enhanced by the hand-work, but not even such an exquisite makeover could quite manage to tame its abrupt angles, slants and slopes, these remain as dramatic as ever. The Oktopus II series features a 3D dial with stencil-work, skeleton-work and ripple effects, making for a most interesting of dive watch faces. The moon disc rests at the bottom of a trio of layers and its photorealistic replication of the current moon cycle which rotates clockwise promises to provide a compelling panorama by day and with its luminescent qualities, will offer a stunning after dark perspective well worth turning back your cuff for. The Linde Werdelin Oktopus II Moon Tattoo will be limited to 59 pieces, a number chosen to represent 2 moon cycles of 29.5 days each.